Our local sportsman, Cody is back in action. 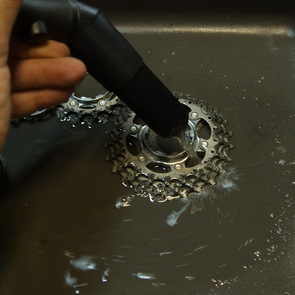 This time he is cleaning the gear sprockets on his bike with The BenchtopPRO parts washer. After a long summer of riding, he degreases the sprockets without taking them off of the bike. Thanks Brian, for taking the time to explore our favorite parts washer to share with your readers. A clean well maintained bike is a great way to start the new year. Next time feel free to remove your gloves, the solution is non toxic and safe on your hands. Happy riding! 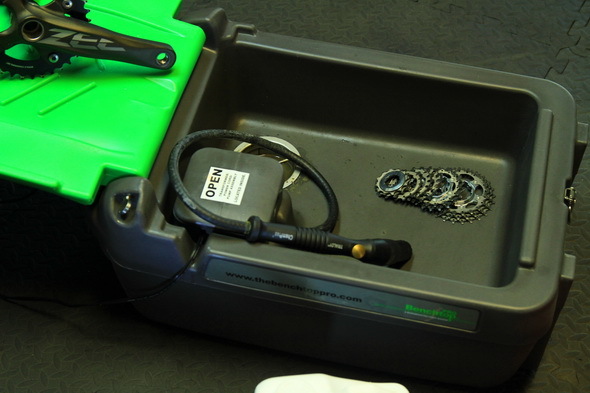 The BenchtopPRO parts washing system is an excellent portable home or shop tool that uses bioremediation technology, combining a non-hazardous, non-toxic and non-flammable degreaser and microbial additive to clean dirty bike parts. The self-contained unit pumps the cleaning solution (degreaser and microbes) up through a hose to a brush, which you then use to wash and scrub the part to help remove contaminants. The stiff bristles of the brush remove stubborn contaminants, especially if you allow the solution to do its job. The design of the system is quite functional, consisting of the main unit with its fold-out lid that acts as a drying tray, the wash tub, pump, hose and brush, and the inner solution reservoir. I did notice that on occasion it leaked minutely from the bottom when stored vertically, and some fluid rolled up under the bottom of the drying tray when be used, but both were very minor issues. It would be nice if the pump worked off a vehicle battery or plug, since it would make the unit useful for some road trips. It comes with a 5 Year Warranty on all parts, including the pump and flow-through brush, and retails for $385.00, though currently they have a special pricing of $299. It’s not the cheapest way to clean parts, but the BenchtopPRO parts wash system is safe to use, self-contained, portable and does an excellent job. The BenchtopPRO is simple to use, just pop it open, connect the power up and your good to go. The scrub brush has long stiff bristles, which allow it to get deep into the nooks and crannies of parts, helping to remove stubborn stuck-on grit and grime. It does take just a little time for the degreaser and microbes of the solution to do their cleaning work, but it wasn’t that significant. The on-off button worked nicely, allowing one good control of the solution stream, and even though the flow wasn’t substantial, it worked fine and kept things from back splashing. It did a great job cleaning off nasty cassette and derailleurs, and I even used it to clean off the built-up residue on brakes (minus the pads). Once the parts were cleaned, I placed them up on the drying rack, and let the excess solution roll back down into the tub. A very small amount of fluid that had drained off the parts clung to the drain board, and ran back between the lid and the main body. After a decent drying time for the cleaned parts, I put the power cord and adapter back into their compartment, and closed and latched everything up. Even though I cleaned and dried up the tub, there was a minute amount of solution leakage from the bottom when I stood the unit up vertically, perhaps it might be some excess from the hose and brush. There is nice large carry handle for vertical carrying, which is a good thing since it weighs 30 lbs, and contains a bunch of sloshing fluid. In addition, there is hand holds at each end of the unit for easy horizontal carrying, which is convenient for moving it around in the shop and on a table. The microbes in the solution keep breaking down the contaminants even after you shut the box, which means you have a cleaner and more effective washing system. On occasion, you’ll need to replenish the microbes in the solution by adding a new MicroPro pack, and if you use the unit sparingly or not very often, you can hold off the addition until you actually use it. The sell a resupply kit that has another gallon of the BT5 degreaser and eight MicroPro packs, though with my occasional usage, I’d like them to sell the microbes packs by themselves. 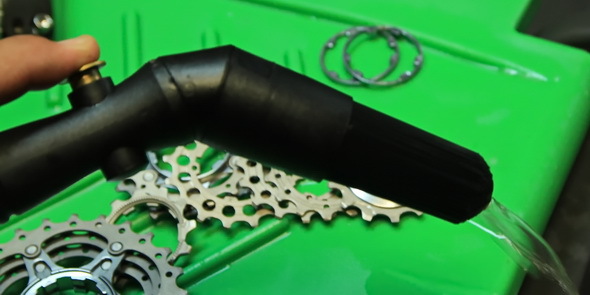 Singletracks: If you’re a gear head, this is the washer for you! 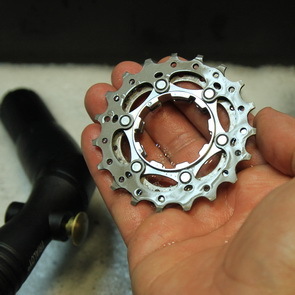 Syd from Singletracks gave The BenchtopPRO a good workout cleaning his mountain bike components. Read on to see all of his great comments and pictures.